Add organization to your pantry or kitchen cabinet. Made of durable plastic, this organizer is great for storing spices, gravy and seasoning packets, coffee accessories, tea bags and more. The practical design has separate compartments to segregate different packets while keeping them neat and tidy within your cabinets. Smooth and lightweight, the storage organizer is easy to pull out and the open design allows easy access to the packets inside. Not just for the kitchen, the storage drawer can be used to organize cabinets and countertops in offices, bathrooms, utility rooms and craft or hobby rooms. InterDesign’s creative products enhance your décor, turning simple home solutions into must-have elegant accessories that shine. Designed in the USA, we are proud to produce a wide selection of high quality home, bath and storage solutions that excite, inspire and charm. Stylish, functional and affordable, our products have been enriching customers’ homes for over 40 years. InterDesign: innovative products, exceptional value. GET ORGANIZED: Perfect storage solution - 5" x 10.5" x 3.5" container for spice and gravy packets. REACH THE BACK: No lost packets at the back of deep cabinets - slide out organizer for easy access. 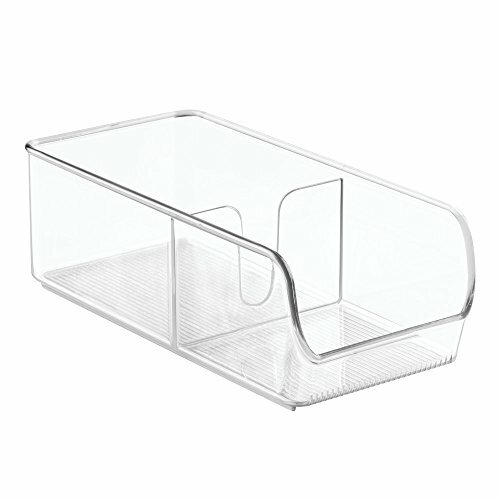 CLEAR & DURABLE: Strong, clear, plastic storage container with 2 compartments and ribbed bottom. VERSATILE DESIGN: Great for use in kitchen, pantry, office, utility room, hobby/craft room and more. View More In Pull-Out Organizers. Zanzer Premium Organic Bamboo Cutlery Organizer - Adjustable with 5 Compartments Storage Dividers | Multifunctional and Perfect Holder for Kitchen Utensil, Flatware, Silverware - 14" x 11.5" x 2.25"